This supernatural road trip show took an appreciated detour last week to explore the character of Laura Moon, Shadow’s dead and very complicated ex-wife, but we’re back on the main thoroughfare with this week’s “Lemon Scented You.” Back to Old Gods and New Gods, super-zombie wives, angry leprechauns, and Mr. Wednesday’s cryptic knowledge about what’s happening to poor Shadow’s life. The Coming to America story this episode is a 3D animation, perhaps because it’s the oldest story we’ve gotten so far and it needed that storybook touch. It’s dated at about 14,000 B.C., a tale of ancient Siberians crossing a land bridge to escape deadly cold and, as this story generally goes, discovering that the food and riches promised to them are absent. The shaman of the tribe seeks advice about finding food from their god, Nunyunnini, but the price is too high to pay and the tribe chooses to abandon their god rather than heed it. Unlike previous Coming to America vignettes, where gods are pulled from their lands in the hearts of the people traveling to the New World and kept there with storytelling or prayers, the tale of Nunyunnini is one of a god forgotten who, once forgotten, dies. It highlights the necessity of humans in the life cycle of gods — the main idea of American Gods’ mythology — and proves that gods can die just as well as they can live. Shadow arrives in his hotel room to find his dead wife sitting on his bed and honestly, bless Ricky Whittle because the way he plays Shadow’s shocked, subtle freak-out is so, so brilliant. The writing is pretty brilliant, too, but Whittle just sells every micro-expression. Like, I don’t actually know how the average person going through a crisis of reality would react to finding their dead spouse looking lively, well-dressed, and waiting for them in a hotel room, but throwing a pillow at the face of the undead manifestation to make sure it’s real seems like the right move to me. The Moons have some things to discuss. Shadow’s first topic: Laura cheating on him. While Laura seems more focused on the fact that she’s having a posthumous chat with her husband, wives rising from their graves is old news to Shadow (“Don’t think that anything you got to say or do, including dying, is going to distract from the subject at hand.”) and he’s more interested in her activities while alive. As Laura begins to explain herself, it’s even more clear now than it was in “Git Gone” that death hasn’t changed her much. She has the same no-nonsense, objective way of looking at life as she did when she sat Shadow down and told him she wanted him to rob a bank for her. When she’s done talking apathetically about cheating on Shadow and then dying (she was “very blah about the whole thing”) Laura asks Shadow to get her some cigarettes. Somehow, this show manages to make a trip to the cigarette machine look beautiful and emotive, helped along by the lights around the “Starbrite Hotel” — another hotel with a significant name, this time reflecting on the golden glow that surrounds Shadow every time we see him from Laura’s perspective. While Laura soaks her dead flesh in a warm bath to keep herself warm to the touch, Shadow finally recognizes that his wife coming back from the dead is weird. He tells Laura that he had a feeling she was going to die when they spoke while he was in prison, and Laura tells Shadow that she doesn’t really feel anything. Until she kisses him, and then we get a glowy image of her dead heart beating once in her chest. The scenes between Laura and Shadow are strange and sometimes strangely sweet, especially when Laura says that she’s looking out for Shadow and thanks him for the “present” of the lucky leprechaun coin he “gave” her. Laura is more animated and smiles more frequently while dead than she did over the entire course of “Git Gone,” thanks to the glow that surrounds Shadow whenever she looks at him. Sense comes to Shadow quickly, though, and he makes it clear that he’s not her “Puppy” anymore. He can’t be, ever again. Mr. Wednesday interrupts the Moons’ conversation with a knock on the door, inviting Shadow out for “five, six drinks” to help them forget the trials of the day. Shadow rejects the offer, but interruptions abound! The police show up to arrest them both for the bank robbery they pulled off a couple episodes ago. Laura, back in her warm bath, notices Shadow’s golden light fading as he’s driven away. We see Technical Boy, the douchiest of the New Gods, getting snatched up by the same weird device that transported Shadow to his limo in episode one. Waiting for him in the limousine is Media, wonderfully dressed as David Bowie from his 1973 “Life On Mars?” promotional video, right down to Bowie’s iconic mismatched eyes. She has some advice to give Technical Boy on his brand and image, how the world — and Mr. World — sees him, and criticizing how he dealt with Shadow. She does most of her talking in David Bowie song lyrics, which I absolutely adore, quoting, in order: “Oh! You Pretty Things,” “Rebel Rebel,” “Space Oddity,” “Life on Mars?,” “Under Pressure,” “Cat People (Putting Out Fire),” and “Starman.” This is the quality TV content I live for. On behalf of Mr. World, Media orders Technical Boy to apologize to Shadow and Wednesday. We don’t yet know who this Mr. World is, but it’s evident that the New Gods see him as a leader — and one not to be messed with or ignored. Media explains that keeping Wednesday calm is critical, because all he needs is “just enough” belief to take them down. After being apprehended by the police, Shadow and Wednesday are separated and interrogated. Shadow won’t say much more than “lawyer,” but Wednesday has adopted the confused old man persona that got him a seat in first class in the premiere. Whether intentionally or not, Wednesday has pinned the whole thing on Shadow, saying that the Shadow stole him from a retirement home. The officer interviewing Shadow theorizes something close to the truth, but lines up a more realistic sequence of events: Shadow meets an old grifter and signs on to learn the trade. The officer interviewing Wednesday gets the actual truth but doesn’t believe it because, honestly, who would? However, Shadow’s officer can tell that there’s something bigger going on than a simple grifting partnership — the tip they got on their whereabouts was specific and high tech, which means Shadow and Wednesday must have some powerful enemies and it’d be interesting to know who those enemies are. When the officer allows Shadow into the same room as Wednesday, Shadow confronts his employer about who’s after them. Meanwhile, a spider (Hi, Mr. Nancy!) unlocks their cuffs and they hear a ruckus going on in the police station. Before they can escape, Media shows up wearing the guise of Marilyn Monroe and, once again, Ricky Whittle’s reaction to stuff as Shadow is just the best. When he realizes that Media is floating down the hall, he’s more shocked by that than he was about his undead wife. Before Shadow can have another breakdown, they hear footsteps in the hall. Enter: Mr. World. Probably the most enigmatic of the New Gods, Mr. World doesn’t have an obvious association with anything like Media or Technical Boy do. The closest I can get to pinning him down is as a representation of knowledge, specifically “secret knowledge” in the vein of conspiracy theories and ominous world enterprises that manipulate society. Mr. World calls Technical Boy in to deliver an apology. Technical Boy does, but his wide-eyed stare and cavalier way of describing how in “poor taste” lynching Shadow had been, what with America’s current state of racial tension, makes him seem insincere. Mr. World senses the insincerity and offers Technical Boy up for Shadow to punch a bit as compensation. Shadow rejects the offer, and Mr. World absolves Technical Boy of his sins. Mr. World is really odd, and I can’t tell if that’s the character or if it’s because he’s played by Crispin Glover. The New Gods have a deal for Wednesday and his kind: a merger. An upgrade to, as Media puts it in her most commercial way, “a brand-new, lemon-scented you.” Media presents Wednesday with a shiny possible future that includes a rocket named after him hitting North Korea, so everyone would know his name — something that is, of course, critical to a god’s survival. Also, there are rainbows and unicorns. Wednesday rejects the plan on principle or pride. He states that the New Gods distract and simply occupy people’s time — the Old Gods gave people meaning. “Then give it to them again,” says Mr. World. Then he leaves, but Technical Boy ruins his departure “on a good line” by questioning him about letting Wednesday go. To shut him up, Media knocks Technical Boy’s two front teeth out by blowing him a kiss. The New Gods are bizarre. Earlier in the episode, just after Shadow left his hotel in a police car, Laura was paid a visit by Mad Sweeney. Sweeney still wants his lucky coin back, but Laura has a feeling that the coin is the reason why she can currently walk, talk, and knock a leprechaun into the wall with a flick of her finger. So she’s not giving it back, and Mad Sweeney can’t take it — but he can wait. Laura Moon is still dead, no matter how much her afterlife makes her feel alive, and she will rot like any other dead body. Especially if she keeps trying to mimic living flesh by soaking in warm water. Mad Sweeney shoves Laura under the water of her bath just as police arrive and they arrest him for killing her. Laura is sent to the morgue while Mad Sweeney is carted off to jail, where his officers encounter the bloodbath the New Gods left behind in the police station. The police are dead, the whole place is a lights-flickering mess, and Shadow is nearly killed by the grasping branches that haunt and antagonize him in his dream of the bone orchard. Wednesday and Shadow run away. Mad Sweeney runs away. Laura wakes in a morgue and keeps on not living. 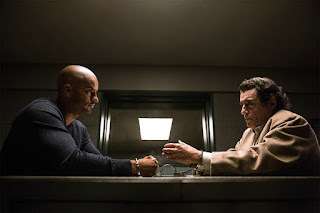 Ian McShane talking to a raven is a scene I didn’t know I wanted to see on a TV show until American Gods delivered it to me. Wednesday is officially named as Odin in this episode! I’ll still be calling him Wednesday, though.